Our first days in Turkey are like a foretaste of paradise. The perfectly smooth tarmac road gently hugs the coastline and a kindly following wind assists us on our westward journey. On our left, to the south, we still catch the occasional glimpse of a snow-capped peak, whilst every evening the sun sinks into a beautiful turquoise sea. 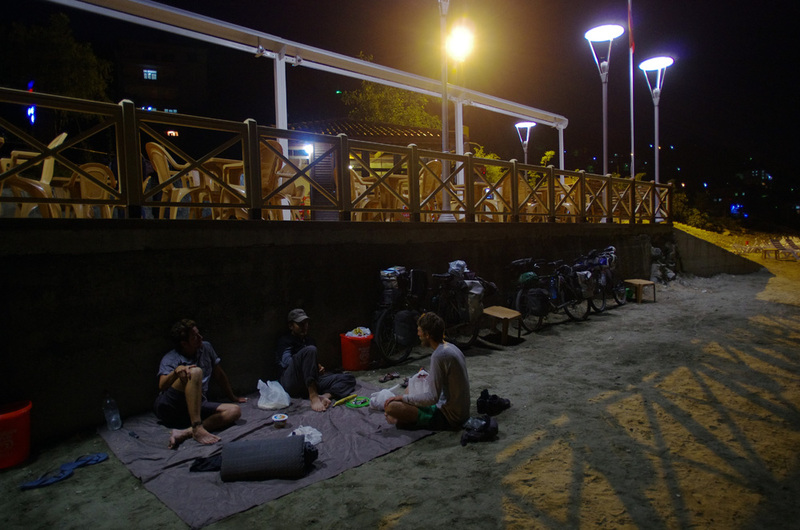 A shower with feet in the sand, a warm tea or a Turkish coffee to follow, and we pitch tent on the Black Sea shore. By the light of a pale full moon slowly emerging from behind the mountains we fall asleep, lulled by the regular rhythm of the waves breaking a few yards from our «front door». Our second day is memorable for an encounter with a young Swiss guy. We first came across him briefly in Georgia when he was heading directly into Turkey, and we were anxious to get to the coast for a dip in the sea. Two days later, on June 23rd, we are on the beach in Turkey, in the shade of an umbrella, when Birk shows up and calls out: «Hi guys!». He has emerged from the mountains and is just setting off along the coast when he sees our bikes leaning against a hut on the roadside. With all of 23 years of life experience to draw from, this modest and enterprising young man is living out a story well worth sharing. Last year, he decided to take a sabbatical with the idea of interspersing his anthropology and social sciences studies with some solid real-life experience. He opted to go and study for six months in Shanghai. Nothing so very spectacular in that, you may say. 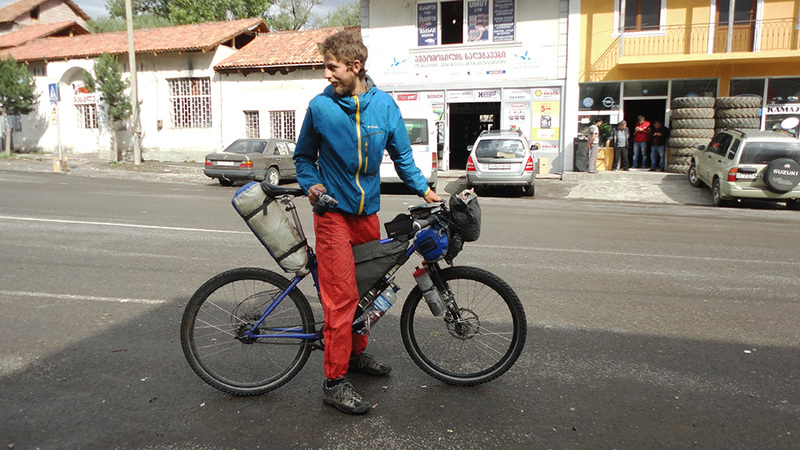 Until you discover that he left Switzerland on a bicycle heading for a city on the remote east coast of China (true, with one or two hops by train or air). And what sort of a bicycle? We have never seen a traveller with so little equipment (see photo). Everything is reduced to the barest minimum, no cooking utensils, a floor mat no wider than his chest, and not even the pleasure of a paperback to read. … When it got too cold in China and he couldn’t find an inn or a hotel, he slept with all (for what that was worth) his clothes on. His sleeping-bag, also ultra-compact, was not much use when the temperature fell towards zero. He is now on his way home and the six days we rode together were a boon for us as well as for him. He was able to benefit from being part of a group, as a change from his solitary daily routine ; and he borrowed a book from us, devouring it within three days. It was also a valuable lesson for us. A Roller Coaster of a Coast road! Our ways part in the township of Bafra. Our new friend turns inland while we plan to remain on the coast. Having toiled through central Asia to reach this stretch of water we are reluctant to leave it. We arrange a rendezvous with Birk between the 9th and 14th of July in the country’s cultural capital, Istanbul. « The best nutrient for the earth is human sweat » Bernard Moitessier would be proud of us as the sweat flows in litres from our bodies along the hundreds of kilometres separating us from Istanbul. Just as ancient Constantinople was not conquered without a struggle, for several days we face violent winds and a fine rain which makes our rear wheels skid on the devilish uphill climbs. We advance painstakingly, at a daily rate of 60, 70 or 90 kilometres and spend the night under a tent ravaged by the bouts of bad weather…. But fortunately for us there are downhill stretches where madness takes over and makes our days so much more exciting. Naturally after these long descents we have a «debriefing» session as we grind our way up the long and tedious opposing slopes. On July 6th we reach Istanbul in a state of euphoria that is by now familiar to us. It has come over us every time we dived into the anarchy of the dense and noisome traffic of those legendary cities: Buenos Aires, La Paz, Bangkok… We ride round the equivalent of the ring road surrounding Paris with a mixture of excitement and stress that awakens all the senses. 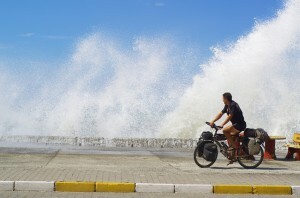 It is a battle against the tidal wave of motorists; it is all we can do to avoid collisions. The smallest mistake can be fatal and we know it. The most dangerous moments are on the feed roads leading out of town, or when we need to thread our way through a line of traffic on our left moving our way but at well over 100 kilometres an hour… At around four o’clock we arrive exhausted but alive at Sonja and Esra’s home. They are to be our hosts, our guardian angels, guides and friends for our week in Istanbul. It is 33 days since we left Dushanbe in Tajikistan. 33 days on the go, advancing non-stop to cover more than 3,000 kilometres. Our only «rest» day was the 30 hour wait at the port of Turkmenbachy. Then 33 nights sleeping in the Uzbekistan desert, in Iranian lorries to Turkmenistan, on the edges of corn fields in Azerbaijan, beneath the pine trees of Georgia and on the shores of the Black Sea. 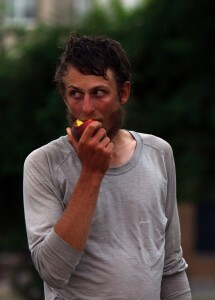 More than a month doing our washing under a service station tap, eating mostly bread, bananas, salami, chips and chocolate, washing ourselves in a jet of water late in the afternoon and starting the next day at six o’clock with the morning dew. Turkey is a lay country and we can’t help noticing that veiled women walk side by side with young girls in miniskirts, men drink tea sitting next to others sipping their beer, and we can ride bare to the waist without being stared or shouted at. Many Turks speak German but only a few spoke English or French on the roads we have taken. At times it has been frustrating not to be able to converse with people inviting us to tea and there is no counting the number of times during our trip when we regretted not being able to speak Chinese or Russian. We have allowed ourselves a full week in Istanbul to recharge our batteries and fall under the spell of this megalopolis, so rich in history and culture. Also, because current anti-government demonstrations have not yet ended we are learning a little more what the protests are all about before sharing with you our impressions and observations, and eye witness accounts of the people involved.